This is the perfect thing to warm up a winter kitchen. Tender cherry tomatoes are mixed with crispy kale and fresh basil, tossed with toasted breadcrumbs and finished with crunchy walnuts to create the most delicious winter meal. We've been feeling the effects of el nino in San Francisco recently with plenty of rainy days. I've been making the most of it with Netflix marathons and yummy comfort food like this bread pudding, which I threw together based off what veggies I had in my fridge and staples in my pantry to avoid venturing outside. Baking can be intimidating. There's less of a sense of control when you're combining ingredients, putting them in the oven and hoping they turn out alright. This is a bit of a loose recipe so it takes some of that pressure off. In one of my smoothie recipes, I include nontraditional measurements like "a handful of spinach." I got feedback that it was refreshing to see realistic forms of measurement, because honestly who is portioning out their spinach in measuring cups anyway? I improvised in this way while making this dish as well, so feel free to do the same. For example, you can add more bread if you'd like a thicker, more stuffing-like consistency or bake it for longer to get a similar effect. 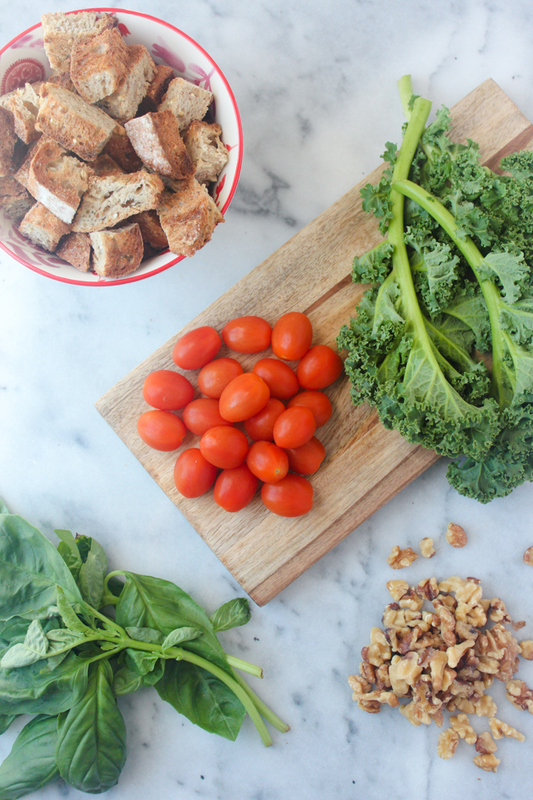 At the end of the day, you're combining fresh tomatoes, crispy kale, crunchy walnuts and bread so what's not to like? Enjoy! - Toast the bread under the broiler until golden brown, flipping half way and set aside. - Preheat oven to 375. 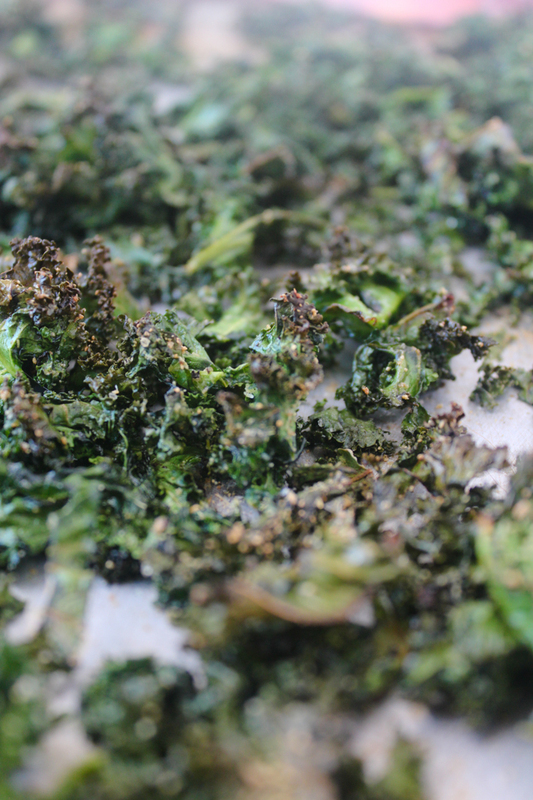 In a large bowl, massage the kale with olive oil and sprinkle with salt, pepper and garlic powder. 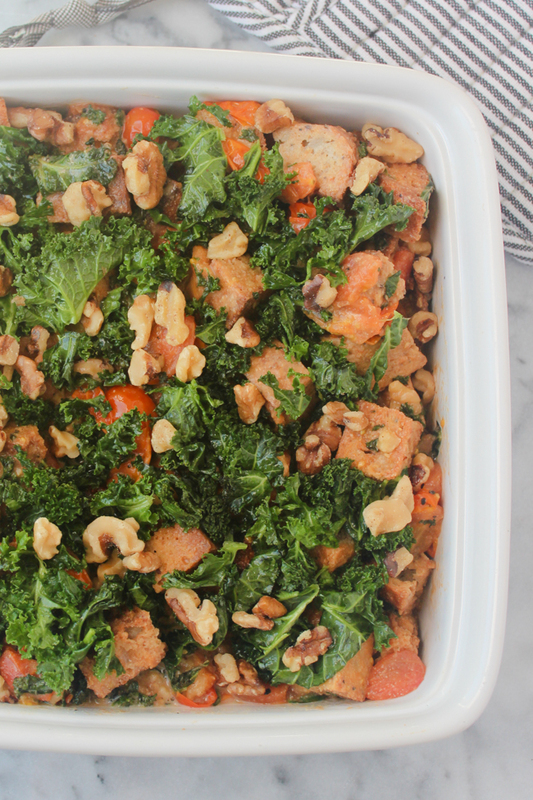 Place half the kale on a baking sheet and roast for about 10 minutes, toss and roast for another 5 minutes or so until crispy. - Increase oven to 425 degrees. 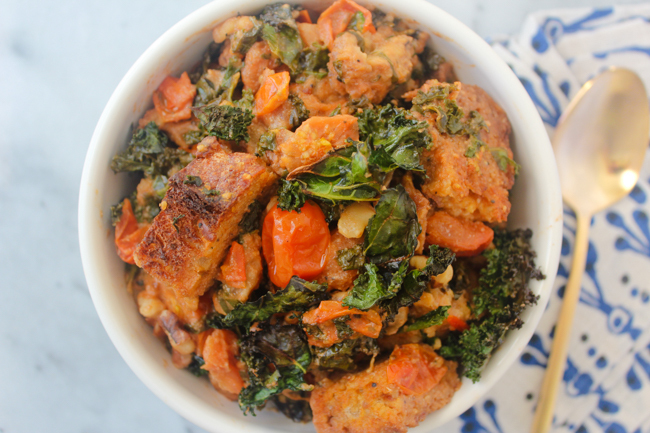 In a large bowl, add the crispy kale, cherry tomatoes, coconut milk, basil, nutritional yeast, earth balance, salt and pepper and stir to mix. Transfer to an 8x8" baking dish; bake until coconut milk has reduced, about 25 to 30 minutes. - Coat the walnuts in one teaspoon of olive oil. 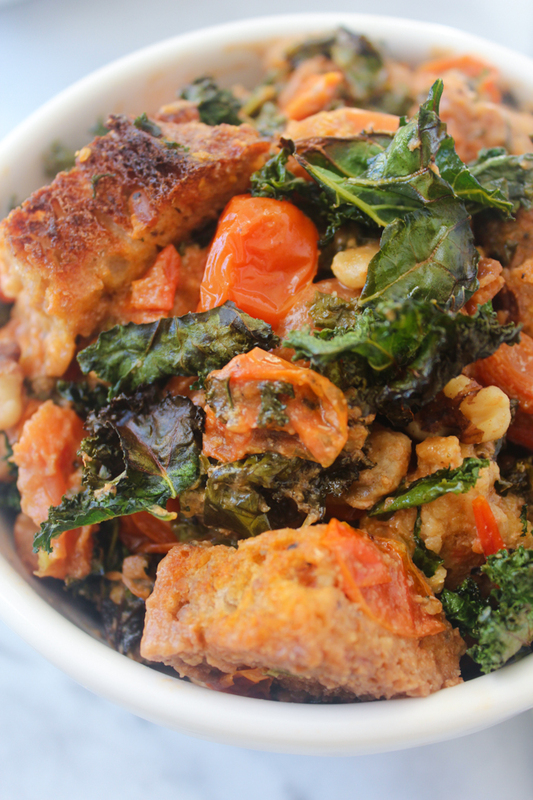 Stir toasted breadcrumbs into tomato and kale mixture, then scatter the walnuts and remaining kale over the top. 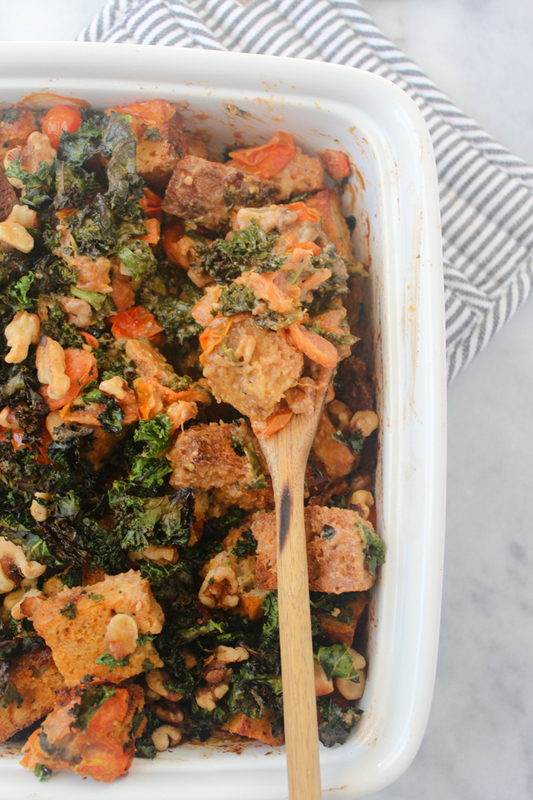 Bake for another 10 minutes until kale on top is crispy. Let sit for 10-15 minutes before serving. This looks delicious, will definitely be trying this! Thank you! 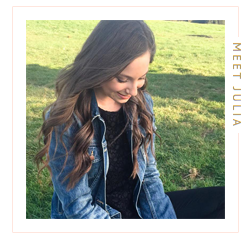 Definitely give it a try and let me know how you like it! Seriously want this! Epitome of healthy comfort food! You are so sweet! 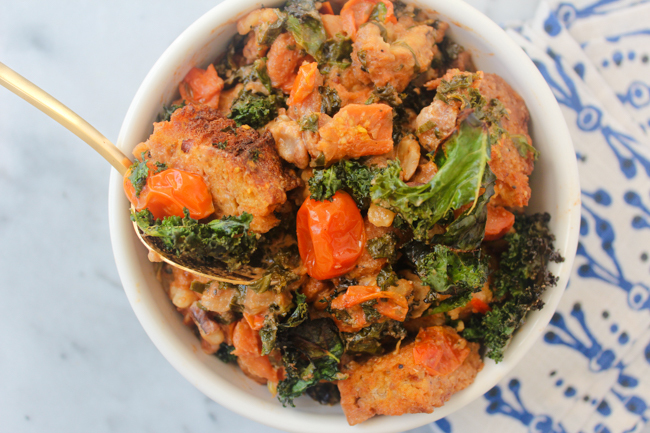 It's seriously super yum but still healthy. Thanks for stopping by! I have learned my lesson and have not come on an empty stomach. lol. just finished eating dinner. I always get so hungry looking at your food pics and recipes...thanks again for the lovely recipes. Looks so delicious! Love to try this! Thank you! It is sooo delicious, the perfect healthy comfort food. Let me know what you think if you give it a try!